OLYMPIA, Washington – Gov. Jay Inslee will join CNN for a town hall tonight. CNN’s Wolf Blitzer will moderate. The town hall is one of five that CNN is hosting with the Democratic candidates vying to run against President Donald Trump in 2020. The first was broadcast yesterday with Sen. Kirsten Gillibrand (D-NY). It was moderated by CNN’s Erin Burnett. 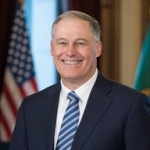 The town hall featuring Inslee will air live on CNN at 7 p.m. Pacific Daylight Time. Inslee is running as a rare single-issue candidate, making combating climate change the central rationale for his campaign. Future town halls will feature former Housing and Urban Development secretary Julian Castro, author Marianne Williamson and businessman Andrew Yang.